Some of what is written in this post is based on pure speculation and rumors from a number of sources. We claim no truth to some things mentioned below, or if they will happen at Halloween Horror Nights 27. On February 23rd Universal released information regarding general ticket prices and the dates. HHN 27 will run for a record 34 nights and take place at Universal Studios. Universal has only released two options for tickets as of this post. We’ve also learned the dates for the Frequent Fear Pass Plus thanks to this UK Ticket Sales site. You can purchase them for £108 (this seems to be fluctuating) which is $140.28. The first house announcement was on March 29th and was the return of American Horror Story: Asylum, Coven and Roanoke. This was the uber house at Halloween Horror Nights 26 and also a fan favorite. Our second house announcement came on May 19th which was the much speculated and fan wanted, The Shining. In between the announcements we uncovered some construction permits for various locations. However the second parade building permit, BLD2017-04385 has been withdrawn. possibly dashing hopes of two houses in the parade building. We’ll keep an eye on this! Now we’ll move on to the SPECULATION and RUMORS! An old friend.. wait a new friend? has popped up on Twitter with some cryptic tweets. Possible hints at things to happen at HHN 27? In the past this person has leaked some information to come true. You can follow The Ifrit to read more and keep up with the information. Speculation has a wide range here, from Cindy making a return to two parks in some capacity (Harry Potter?). We’ve also posted our thoughts on the the Cindy speculation! Back in April we saw a leaked list of houses for Orlando and Hollywood! Will it turn out to be correct? We’re not sure, but here it is! And finally when it comes to shows, we have this which we posted on our forums on May 20th regarding the return on Academy of Villains! 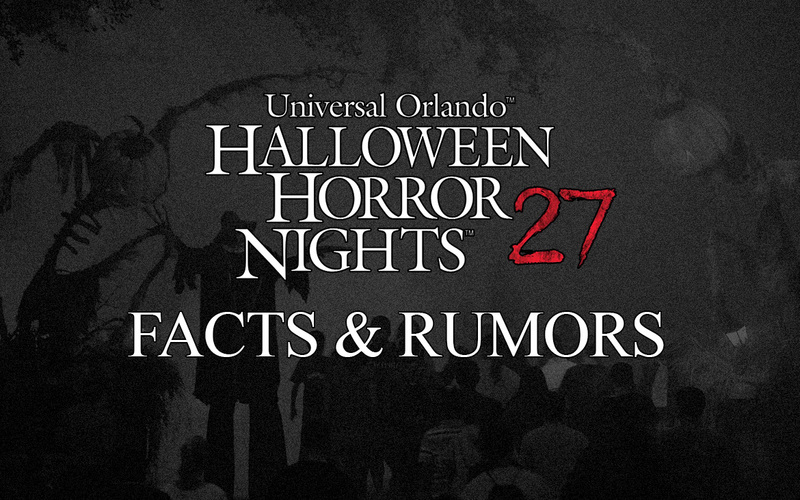 We’d like to hear your thoughts and what you think so far about Halloween Horror Nights 27 as well as the Speculation which you can discuss in the comments below or on our forums!